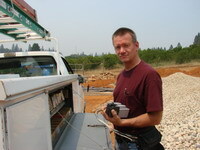 I strive to help everyone I can with great information about their electric wiring project. Thanks So Much for Your Electrical Questions! Please provide COMPLETE INFORMATION about your Home Electrical Question. Most of the time this information can be found on a label attached to the device or the specification sheet. ALSO: If you can provide a clear picture of device and the label information would be very helpful. Be sure to include as much detailed information as you are able. When you are finished simply click the [Submit] button.